It took me four tries over the last 10 or so years to finally finish this game. I blamed it on the backtracking previously, and that's definitely part of it, but I think it has more to do with the controls. It's basically the first-person equivalent of tank controls, which are awkward for platforming and result in silly situations where you get hit sidestepping is the slowest action you can take without a lock-on. And that lock-on is the the other main problem for me - it's obviously necessary if you want to move and shoot with one analog stick, but as a consequence most fights feel pretty much the same. You mash L until you get a lock when you don't have one, then you jump constantly while mashing or holding A until either the enemy dies or you lose your lock and have to start over. Aside from bosses and the odd hallway that's to narrow to jump around in, nothing ever really forces you to change that strategy. Admittedly, the boss fights are actually all pretty interesting, but they're a small part of the game, and the hallway fights usually devolve into either popping around corners until the thing dies or tanking damage if you're impatient. Which is a shame, because there's a lot about the rest of the game I like. The environments still look great even after 15+ years, the soundtrack is perfect for this kind of game, and the world building and creature designs are consistently interesting. I can see why this is such a special game for many people, but for me all those strengths are weighed down by the frustration of fighting the same four turrets in the same places in the same way in Lava Monitor for the seventh time. I'd probably like this game a lot more if enemies didn't respawn and the backtracking was more evenly distributed across rooms. ^ My main issue was finding where to go and what to do, the rest seems fine to me. I know being cryptic is a Metroid thing but I need clear direction. Is 2/5 your rating or the date? I'd give it a solid 8. Although I do like the idea of doing a review system where the scale is constantly changing. That was the best part of Clueless Gamer, so I support it! 30.) I thought there was another game I played before 2018 ended, but I forgot what it was or it didn't exist in the first place. Oh well. I wasn't originally planning on getting this game, but there was a deal that let me get it and DMCV by buying a graphics card, so why not. I never played the original RE2 so I'm not authority on how good it is as a remake but I do like the game a great deal. It's very tense and manages to stay that way even when you come to learn the layout of RPD, which I consider pretty cool. You're never really truly resource-starved at all, but the amount of bullets it takes to kill a zombie trains you to be conservative and to plan things out. Then the game throws a wrench in your plans in the form of Mr. X, who will stalk you incessantly forcing you to abandon slow, careful movement in favor of quick action. I have two 'complaints', and they're more based on stuff I've heard about that were cut from the original. Plot-wise Leon and Claire's scenarios don't really gel together at all and some enemies were cut altogether. Considering one of those enemies is the giant spider, maybe that's a blessing. I've barely played Tetris before, but I can safely say that this game is more terrifying than RE2. One second you're chugging along just fine, the next second Johnny Tetris God dumps 8 rows of junk onto your board. One game, around 5-8 people targeted me at the very beginning of the game. I didn't last long. I hear this is a lot like Advance Wars, but I never played any of those and can't make comparisons. I can say that it's a turn-based skirmish game that puts a ton of emphasis on unit matchups, holding money-generating buildings, and build orders. You start out with a handful of units at the start of every mission, but success is usually determined by how quickly you can build up the money to start recruiting more powerful units. The most expensive ones can be as much as 12 times the cost of your basic swordsman, and you rarely have more than one or two buildings to recruit with per turn, so those recruiting at the wrong time or letting an expensive unit die too early can sink a battle almost immediately. But it's probably most interesting for completely eschewing randomness. You can see exactly how much damage a unit is going to do before you attack, and even critical hits are determined by positioning rather than dice rolls. It's a great demonstration of how little randomness actually adds to other strategy games, and it's something I wish XCOM and the like learn from in future iterations. Staying on the positive side, it also has an impressively robust custom campaign creator, and there are puzzle and arcade modes for anyone who still needs more. Still, it ended up not quite working for me. Some of it was down to usability issues: there's no obvious way of seeing which units haven't activated in a turn, the auto-pathing frequently does stupid things when you're setting an attack, you can't overlay your own movement with the enemy's attack range for some insane reason, the game is unbearably slow with animations turned on, and enemy turns feel too long even with them off, etc. Then it did the thing that always bothers me about these kinds of games and made later battles hard by giving the AI ridiculously favorable setups instead of making it smarter. I get that this complaint is pretty specific to me and plenty of people are fine with that, but I got bored of the scenarios halfway through and dropped the difficulty all the way down so I could see the end and be done with it. It's not a bad game, but it wasn't quite what I'm looking for. I played about a third of it when it came out and then never finished. I liked it then and still like it now, but I don't think the motion controls add much of anything, the water levels are uniformly awful, and the camera really struggles with some of maps. Still, I had a good time with it, and I might've even stuck around to try for 100% if I didn't have a million other games I need to get to. Gathering Storm mostly marketed itself on natural disasters and climate change, but it actually makes significant changes to just about every part of Civ VI. There are decent number of new units, the future era finally has meaningful technologies in it, most of the victory conditions have been reworked, and diplomacy has been rejigged to focus on influence points and the world congress. Most of these changes are for the best. The new units are fun, especially the late-game Rock Band, the new techs prevent science leaders from losing any meaningful advantage in the late game, and science victories finally feel as involved as most of the others. Disasters seem like they'd be cool, but I wouldn't know, because somehow every single one (except a minor river flood in the first twenty minutes) missed me. Alas, the diplomacy AI is still nonsense, and it's made much worse by the increased focus on that mechanic. I was constantly bombarded with inane trade offers that demonstrated the AI has no understanding of the value of most resources, and your late game relations with other Civs seem to be almost entirely determined by your government type. I suddenly become friends with almost everyone when Democracy was the hot thing in the Modern Era, but no one followed me to Digital Democracy in the Future Era, so suddenly I lost all my alliances and Spain attacked me for no reason. I ended up nuking them in response. The good news is that these finally feel like a real deterrent - one missile was enough to flip a city into rebellion (another new mechanic) and end the war. The bad news is that despite using a nuke defensively, the new emergency system kicked in and incentivized the whole world to declare on me in retaliation. In other words, using nukes as a deterrent makes your situation worse, which means they're not a plausible deterrent. This was made even more ridiculous by me winning a diplomatic victory two turns later. They've also made changes to spying that are frankly a disaster. Despite having every single one of my allowed spies in my capital running counterintelligence, every AI Civ was sending such an absurd number of operations my way that I was still getting hit by something almost every turn by the end, which meant I was constantly having to deal with barbarian uprisings, having my technology stolen, or having my income effectively wiped out for several turns. I have no idea how I was supposed to counter this. The new diplomatic victory is pretty bad as well. You need 10 points to win, but points can only be acquired 2 at a time from winning council votes, or 1 point each from two technologies and a wonder. Since the council only meets every 30 turns, you can only afford to lose one or two votes before it's hopeless, and given that the options are "award two points to this player" or "steal two points from this player", it's absurdly easy for any players out of the running for a diplomatic victory to band together on the second option and make it impossible to attain. I only succeeded because the AI always votes "award" until someone can win, so you just need to hit 7 points, win a vote, and then get one of the single point options. This would never work against humans, and it also has almost nothing to do with diplomacy. So it's kind of a mixed bag. I loved it up until the endgame, but the endgame dragged on forever and was completely miserable. I don't think all of that can be blamed on me trying for the victory that's always been awful, either - the spies and roller coaster relations still would've been aggravating regardless of how I was playing. A concept game that has you play as a sentient roomba protecting the house from increasing numbers of burglars. It kind of acts like it's a stealth game at first, but it's actually far more effective to get all the burglars' attention immediately and then have them chase you in a conga line as you hack everything in the house to murder them. The five levels are all just the same house with one more burglar each time, but it only lasts around an hour and I found the core experience enjoyable enough that I wasn't tired of the repetition by then. This could be a really fun game with more levels and deeper mechanics. Katamari with a sword, but also forgetting that one of the main reasons Katamari worked was that you could more or less tell when you were able to roll something up. In C&R, it's basically a guessing game. A larger sword always cuts more than a smaller one, but larger objects aren't necessarily harder to cut than smaller ones depending on the material, and there's no obvious way of telling when certain things are suddenly cuttable. You pretty much just have to whack everything and hope for the best. It's a great podcast game, but frustrating amd slow on its own. It's Taiko again, but possibly the best single-player experience I've had with the series so far. It's got a full campaign mode that, while not particularly deep, is consistently fun and is as self-aware as you'd hope for such a ridiculous premise. A few songs are overused and it could've used a more representative range of difficulty levels, but it integrates costumes in some funny ways and was a great time the whole way. Everyday Dojo makes a return from the first DS game and works in largely the same way, but songs rotate at each level, so it's easier to avoid getting stuck at a particular skill rank when one song is just too difficult. It's also only the second Taiko DS game chronologically and came out about a decade ago, so I've got high hopes for the more recent handheld games. I don't normally review games I gave up on, but I put over 30 hours into Sunless Skies and it's a really fascinating case study of design flaws, so I'm making an exception. SS is a very iterative sequel to Sunless Sea. Like its predecessor, it's a Gothic horror (?) game about Victorian London ending up in a mysterious new land - or space, in this case. Other than a new combat system and the addition of perks, there's nothing fundamentally different about the gameplay. You're still sailing from port to port on a randomized map, and you still complete stories and trade items at those ports in order to progress the game. It's still phenomenally well written and imaginative. And yet, where Sea kept me engrossed nearly the entire way through, I abandoned Skies once before trying again as a podcast game, then ran out of patience for that and tried cheating, then ran out of patience for that and gave up. So what went wrong? First, SSk's layout makes it a fundamentally slower game than SSe. Where the latter arranged its random islands on a grid, where each port was always in the same column and columns became more difficult as you moved right, SSk divides its ports across four circular worlds, where one acts as a portal to all the others. Although this prevents players from wandering into high level content too early, it also breaks the trading loops that were so core to SSe. In that game, you could start from London and plan a route to hit a dozen ports, with room for exploration, in one go. In SSk, no single world has more than 8 ports, and their circular layout means that it's often most efficient to just run back and forth between edge ports and the "core" of that world. As a result, a trip of the same length in both games not only sees less interaction with ports in SSk, it's also more repetitive since you're just going to a place and turning around. You don't *have* to play this way, but the layout of some worlds essentially forces it, and supplies concerns make it more efficient in the other two. And that's to say nothing of the enemies, which are too fast to outrun even when they're moving sideways and constantly force you into tedious and unrewarding combat. Next, progression is just less interesting. SSe's ships had speed upgrades that made getting a new one really exciting, but SSk's locomotives just have different equipment slots and storage space. There are absolutely interesting stories in SSk, but they're mixed in with loads of actions that don't have much payoff, and I never found anything as fun as SSe's most outlandish islands. You never know when a story is going to lead to something meaningful or when it's just incrementing an endless counter so you have a source of money, and that's aggravating when everything takes so much time. Some of it is undoubtedly that I'm in a different place in life than I was in 2015: I have less time for more games, and thus I'm less willing to spend an hour mostly watching a ship slowly move across mostly empty space. But I also think SSk is just fundamentally flawed in a way that SSe wasn't. I hate to say it, but it feels like SSe by way of Ubisoft: a huge, empty world full of meaningless repetitive tasks that just server to make it four times as long as it needs to be. There's a great game buried in SSk, but it's not worth digging for it. I played these with a controller, which you shouldn't do. They still worked pretty well, especially considering I was streaming, but there were some scenes in both games that were unreasonably difficult to impossible to complete with analog input. Never had a PS2, so I completely missed this series. It actually holds up really well, all things considered. Everything being OHKO isn't exactly in vogue anymore, but it works well for this game, and for the most part it increased tension more than frustration. There's a ton of variety in the level design, and even if the racing levels maybe didn't need to exist, most of what they tried to do succeeded. Definitely worth playing today. It's a block swapping match-3 with a Pokemon anime skin. It didn't seem like there were any notable changes to the standard genre mechanics, and the story mode is just 12 matches in a row with some incredibly brief appearances from anime characters in between. It's fine in the way that any of these games are fine, but I'm not sure why it needed to exist. I've heard this described as Resident Evil but Sengoku, but I don't think that's really fair. Although it is obviously a classic survival horror, there's a ton more emphasis on combat, it's not as heavy on backtracking, and it feels kind of caught between RE2 and 4 in terms of how seriously it's taking itself. The biggest change, beyond the fact that you're primarily fighting with swords instead of guns, is absorbing souls from defeated enemies. It's how you replenish health and magic and is the only way to upgrade your equipment, so fighting enemies at least occasionally is critical. Enemies also always respawn, so there's no possibility of permanently clearing out rooms like in RE. That said, combat is kind of a mixed bag. Small enemies have an annoying habit of falling down after a few strikes, which renders them immune to anything except a downward stab that uses the same button as your regular attack and only triggers when it wants to. Since that animation is exceptionally slow and can't be cancelled, fighting groups of enemies inevitably devolves into playing whack-a-mole as they get back up until they're all dead. Ranged enemies shake this up by taking cheap shots at you from off screen, and large enemies force you to block, or at least to hope that each attack isn't one of the ones they've randomly decided are unblockable. Bosses are basically even larger enemies, so they tend to be a mix of running in circles and/or blocking in a corner depending on their attacks, and are best dealt by spamming your special attacks either way. Despite all those complaints about the combat, it's actually pretty fun. The whole thing only runs about 3 hours, so you never really have enough time to get frustrated with any specific part of the game, and it's good enough at varying up the gameplay to keep you engaged. I wouldn't say it's by any means an essential play, but it's worthwhile if you're looking for an early 2000s survival horror. Just Cause 3: I gave up on this one within 10 minutes the first few times I tried to play it because everyone said it was repetitive and basically just JC2 again, and the opening doesn't do much to change that. Picked it up again last week for about an hour, then demoted it to podcast game and really enjoyed it for the 5 hours it took to clear out the first island. Then I started having to do story missions, which are incredibly boring, and eventually reached the second island, which gets in its own way with way too many enemies that kill you too quickly. Sly 2: Honor Among Thieves: I think the first game aged so well in part because there's nothing much like it on the market now. Sly 2 ditches one-off platforming levels for small hub worlds and takes the gameplay to a weird mix of stealth and action that's pretty bad at both. I'm sure it was very innovative for 2004, but there's nothing technically impressive about it anymore, and its threadbare stealth mechanics and trivial combat don't come close to making up for that. You could do a lot worse from the PS2 era, sure, but I completely lost interest after the first two chapters. An open-world 2D action RPG that was probably the result of someone being challenged to make a game entirely out of cat puns. It's extremely repetitive, the humor misses as often as it lands, and the combat is never challenging, but it's just that right level of mindless to be a really great podcast game. There's also a twist at the end (and a few others scattered in sidequests throughout) that really deserves to be in another story. It's nothing mindboggling, but it was clever, and I'd be interested to see a more serious game from these devs. I really enjoyed this a lot! It's a point-and-click adventure game by the same people who made Maniac Mansion, which also takes place in the same universe as it features several of the same characters (and their relatives) and references the events of the game. As a big fan of Maniac Mansion, I really appreciate that. It almost makes this game feel like Maniac Mansion 3. The characters are all really interesting and enjoyable and I really enjoyed the murder-mystery style intrigue. For the most part I figured out a lot of the puzzles on my own, but a few were too obtuse for me. Luckily the game has a built-in hint line that you can use. It's nice since it will only give you as much information as you want but will never outright solve the puzzle for you, and it's completely optional. The ending... I'm not really sure how to feel about it. The actual final scene of the game ends in a very cool, unsettling way, but whole last half-hour of the game feels like the plot shifting gears completely. You get closure for all your playable characters (which is actually really nice and has some very gratifying and emotional moments) but there's still loose ends and unsolved mysteries and I kinda wish the game had explained those a little bit before derailing. Maybe an epilogue could have explained those things but based on the specific way the plot resolves I don't think that's on the table. Despite these gripes I don't regret the overall experience. It was a lot of fun and I really got invested in these characters and their world, and I would still recommend the game to anyone. Two games that should've been more interesting. Got both for free, thankfully. I don't know if this is necessarily fair, but I associate Dejobaan games with cheap knock-offs of established series because I first heard of them through The Wonderful end of the World, which is just budget Katamari. 20MM does nothing to change that association by being the most basic city-builder I've ever played. You connect houses to food and resource producers in order to get plastic and stone, which you use to build score-generating parks. Sometimes your resource producers exhaust their supply and you have to move them. And that's it. After 20 minutes, you get a score that doesn't seem to have any meaning. These mechanics would struggle to say interesting even as 5 Minute Metropolis. I definitely think there's something in the idea of a short-form city builder, but this isn't it. I was just about to lose interest in this one when it turned out to also be 20 minutes long and abruptly rolled credits. It's ostensibly about politics in (I think) 1960s Italy, but it provides so little context that it's practically useless as an edutainment game, and so little depth that it'd presumably be uninteresting to anyone already familiar with that period. The ending I got (there are apparently quite a lot) hinted at all sorts of more interesting plotlines about revolution, kidnappings, and terrorism, and then abruptly ended at a seemingly arbitrary point without explaining what any of that was about. Maybe I just saw the worst one, but it's not obvious why the choices I made (mostly whether to turn or not) led to that, and the core driving gameplay is so incredibly tedious that I don't really have any desire to go back and find out. Historical fiction seems like it should be a slam dunk for games, but there's remarkably little of it that's any good, now I think of it. Steam had a sale on all the IGF nominees. I've learned that I need to pay more attention to those, because there's some really cool stuff I missed/passed on last year. I probably should've already known that, but better late than never. You play as a WNBA star as her whole life blows up in one day as a result of bad choices in the past and present. A large part of it is about how "WNBA star" is currently something of an oxymoron, and most of the rest is about consequences. It's *really* short, so I can't say much more without just writing a plot summary. It was apparently originally a play, and you can really see that in the design. You only see a handful of rooms in the 60 minute runtime, most of the choices don't have impact beyond the next few lines of dialogue, and they're careful to make sure there's never much action going on. It's a good story, and I do think it's worth playing, but I don't know that it makes sense as a game. Per being a play, they clearly already had an arc and personality in mind for the PC, and adding in dialogue choices just confuses that. You're a member of a secret club tasked with observing people through secret cameras. The club issues you challenges to learn specific things about them, which entails listening to their conversations and piecing together their identity from those clues and the internet. You're strictly forbidden from "feeding the monkeys" by interfering in their lives, but all the best and most interesting rewards come from giving them little (or big) nudges. It's also a resource management game, because you have to keep adding cameras to stay in the club, get food and sleep, and pay your rent. I only got to see maybe half of the stories to anything approaching their conclusion, but all of those were fun. Most of them can be resolved in multiple ways for different rewards. Still, I feel like half the game forgot to turn on. I never felt any consequences for poking the monkeys, and a few of them provide such massive rewards that the resource management was trivial by the end. It seemed like there were some subplots going on to prevent that, but none of them ever amounted to anything. At any rate, it's a really cool 2 hours with a ton of replayability. Definitely worth checking out if quirky adventure-puzzle games are your style. I almost bought this twice in 2018, but one of the reviews talked me out of it. Shouldn't have listened to that guy, turns out, because this is a fascinating game that would've easily topped last year's list if I'd gotten around to it before now. Alas. SI initially acts like it's just another adventure-VN where you're trying to get as many of the group as possible to survive, like the non-combat parts of The Banner Saga. But it promises early on that things are going to get weird as you progress, and it delivers on that. It's clear from the ending screen that your choices can lead to massively different outcomes, so while there's not much point in me talking about the story I got, I can say that it was very well written, consistently engaging, and dove into some of my favorite themes around the meaning of choices. Mileage may vary a little depending on whether you're as into specific narrative beats and themes as I am, but if you are, this is really something special. A playthrough only takes about 90 minutes, and I'm very much looking forward to trying out some other paths in the future. Yeah, I'm counting a plane seat game. Fight me. It had 90 questions that each took 30 seconds regardless of how quickly you answered, so the whole thing took 45 minutes. It asks you to press the spot on the map where the city it's telling you about is located, but plane seat screens aren't very precise, so you get basically full points for being within 1000 kilometers. Almost all of them are really easy to place, and watching the 20 second time tick down 90 times in a row is really boring. But, in the context of a 13 hour flight, there are definitely worse things you could do. The latest studio in line to be the new BioWare is, improbably, Wadjet Eye, makers of 90s-style point and clicks. This one goes all out on the RPG aspects, with three different origin stories, male or female protagonists, and asking you to pick two of four party characters to join you on each of the chapters. Gameplay wise, it's fairly standard for the genre, although the puzzles all stay within the realm of plausibility. But I was playing it for the RPG influence, so the story is the important part. It's about putting your life back together after being possessed by a demon for a year, during which time said demon murdered a ton of people and set up supernatural shenanigans all over New York. It reminded me of Vampire: The Masquerade and Shadowrun in the way it blends the modern world with folklore elements. Unfortunately, the writing is a mixed bag. It feels too proud of itself for what is ultimately not a terribly original world, and the amount of vocab and descriptions that go into the world building can start to grate. The authors also have a... thing for ellipses, to the truly absurd point that you'll frequently see upwards of four in a single conversation. The whole thing gives an impression of wanting to sound more profound without really knowing how. Which is a shame, because the story itself is actually pretty interesting, there are a couple of strong character moments, and the main twist is extremely well done. It's not enough to pull the game up to any remarkable quality level for me, but it's still worth playing if you're into the genre or themes. I don't think I'd go out of my way to play it if, like me, you're only really interested in the idea of an RPG point-and-click, but it's decent as experimental genre mashups go. Everyone has played this. It's still good. The OST still doesn't get enough credit. It is kinda B movie material but it sure destroys other FMV games (although your input is purely restricted to decisions, most of which don't translate to actual story differences down the line). I played through twice, I probably wouldn't have if it wasn't for the really crap first ending I got (second was good so I'm probably done for a while). A fast forward option would be fantastic for replays. Thanks to Ian for giving me the download code for it, I liked it quite a bit. I had this game since it came out but never bothered to actually finish it. I grew up fanatic over Mario Kart and saw any other kart game as a rip-off of Mario Kart. 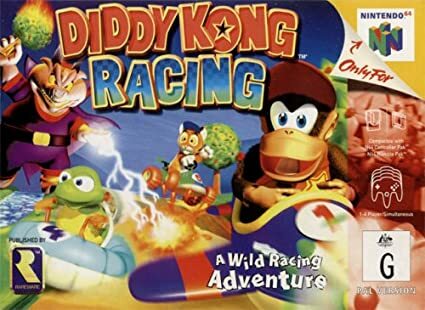 Diddy Kong Racing just didn't appeal to me much. I honestly don't remember why I even have it but it probably was a Christmas gift way back when the N64 was hot and my mother just indiscriminately bought me the most popular games. But now that I'm older I definitely appreciated it more. I mean, I still love Mario Kart 64 more, but this was the second best kart game I've played. I've noticed that the driving is more nuanced - way less ********. It's more about actual driving skill than using items. The characters have a stark difference in their steering and speed, which I could see make for interesting multiplayer matches but I never played with anyone else. Alas, for whatever reason, the series never kicked off (aside from that DS remake). They could have done something more and better with it. Whenever you do sharp turns in tunnels, the game shows its age by having the camera look through the wall. In some particular stages that had tunnels with sharp turns, either you missed the sharp turn and bumped into something or you successfully made the sharp turn but then got distracted by having the camera looking through the wall and messing you up. I eventually just dealt with it. Catching up is something really difficult to do in this game. I played Diddy for a majority of the game until I realized that I just couldn't **** catch up no matter how many boosts I had. I then decided to switch to Pipsy, the little mouse girl, and instantly won the grand prix like they were nothing. At the same time, there were some tricks with the boosts that I didn't realize until later, such as letting go of the accelerator before boosting to go faster. You also should let the boost go all the way before pressing down again, or else you'll end it early. Little things like that make the game slightly more technical than Mario Kart. After you beat each stage in a world once, you race a boss. The bosses were cool. And then you play through all the levels again but this time with the SILVER COIN CHALLENGE. Quite possibly the most grueling thing about this game. Early on, the silver coins are easy but then in later worlds the silver coins are often in out-of-the-way spots that would have you lose 1st place (because you HAVE to get all the coins AND win 1st place to progress). But you know what? The point of the challenges really taught you steering and perfecting your sharp turns. The first time you face off Wizpig is like a culmination of all the things you learned - controlling your steering and taking advantage of EVERY SINGLE BOOST. I really liked it actually. The whole experience was logical in my head. First you learned this, then that, then at the very end you have to put them all together. Judging by reviews and comments from other people, that wasn't always the case when you were 7 or 8 year old back in the day. You may have cursed off Wizpig and left the game alone for the past decade or more. Maybe that's why Mario Kart took off with the crowd more. It was simpler and appealed to an established fandom. So yeah - great game! A little unpolished and dated but overall it's a racing game you should definitely play if you're into racing games. I haven't played the DS version so I don't know anything about that. I assume it did away with any gripes I had about the original N64 version, given better technology. Last edited by ScottyMcGee on Thu Apr 04, 2019 1:20 am, edited 3 times in total.